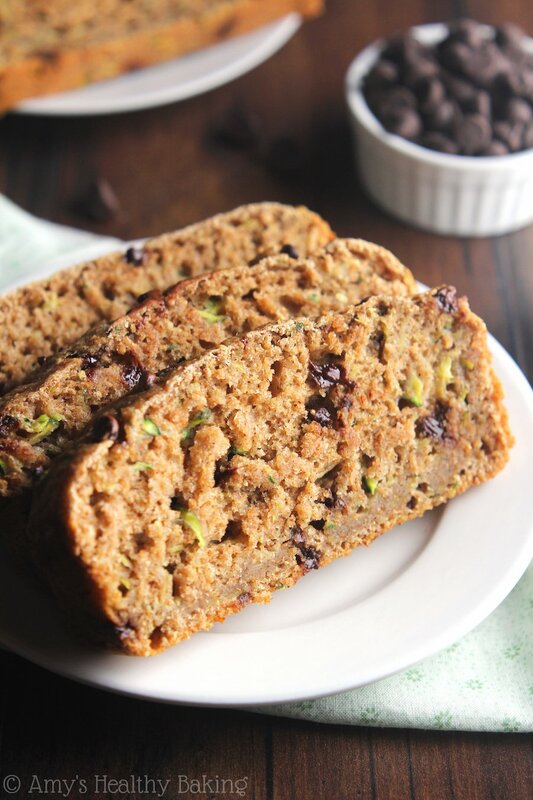 Tender zucchini bread full of cozy spices and melty chocolate chips. This recipe convinced me to plant zucchini in the garden—we finished it that quickly! During my younger childhood years, my grandma flew out from Ohio to visit us a few times. She’d pack her suitcase with enough clothes to stay anywhere from a week to a month, and she always carefully nestled a loaf of her homemade zucchini bread inside too. Although I probably would’ve turned up my nose at flecks of green in my bread from anyone else (yes, even after reading Green Eggs and Ham at least once a week), anything baked by Grandma was automatically delicious, so I would devour almost half of that loaf all by myself. My mom would tuck half of a thick slice into my school lunch box as my treat instead of the usual store-bought chocolate chip cookies, and as soon as I burst through the front door in the afternoon, I dashed to the kitchen to ask Grandma for another piece as my snack. Because we plowed through it so quickly, she almost always baked another loaf (or two) partway through her visit! While Mom enjoyed her slices reheated with a small pat of butter or thick schmear of cream cheese, I preferred my plain. No extra toppings, nothing hiding inside. 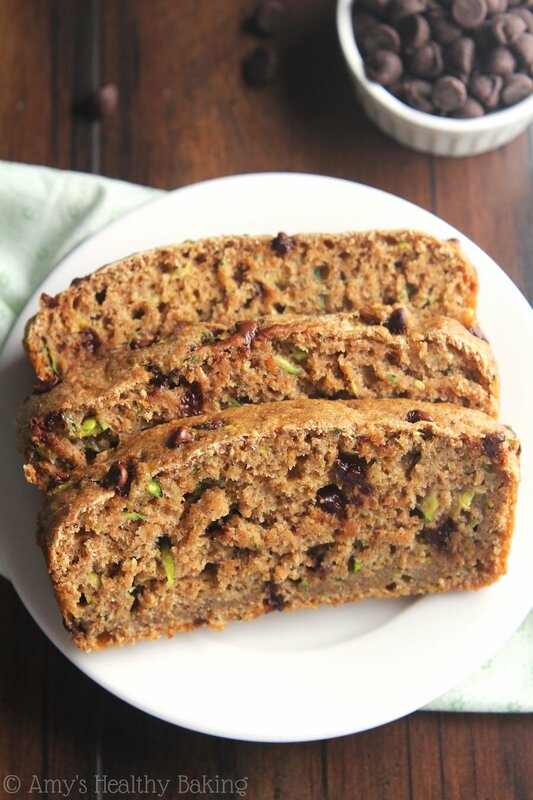 Just plain, supremely moist zucchini bread with lots of cinnamon and spices. And when I recently asked on Facebook whether you liked zucchini bread too, the majority of you answered yes… But with chocolate chips! 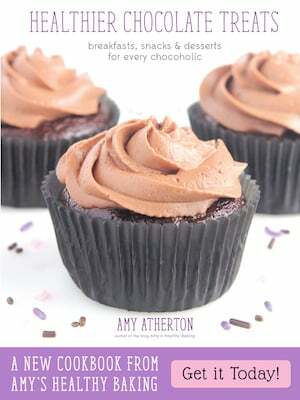 Despite being a huge chocoholic (it’s why I’m writing a chocolate cookbook that’s coming out soon! ), I had never tried that combo. Until now. 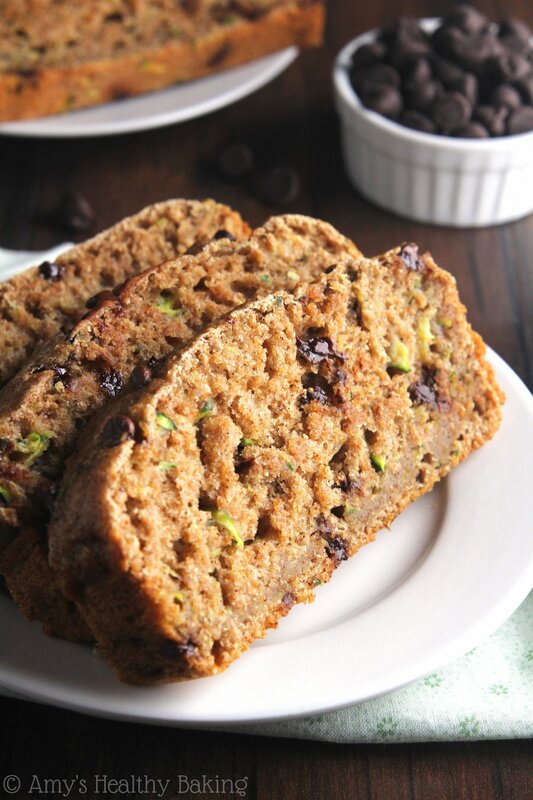 This Whole Wheat Chocolate Chip Zucchini Bread (and all of you, of course!) convinced me that every loaf deserves extra chocolate inside! 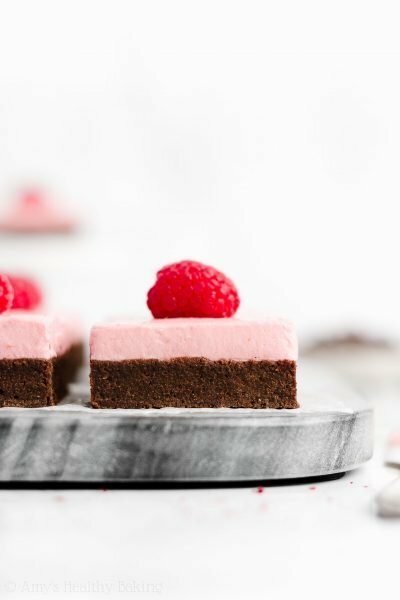 Vegetables and chocolate… Who would’ve thought? Just like my grandma’s loaves, I added both cinnamon and nutmeg to the batter. Although not all recipes include it, nutmeg gives the bread an extra oomph and warm, cozy dimension. 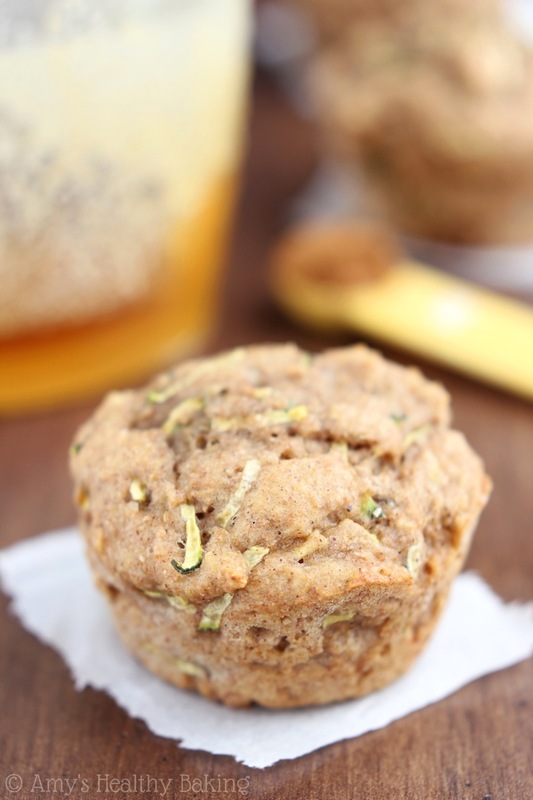 I always mix it into my plain zucchini bread, and since my family adores that, why stop now? But unlike Grandma’s, my clean-eating version contains only 1 tablespoon of oil—and coconut oil, at that! 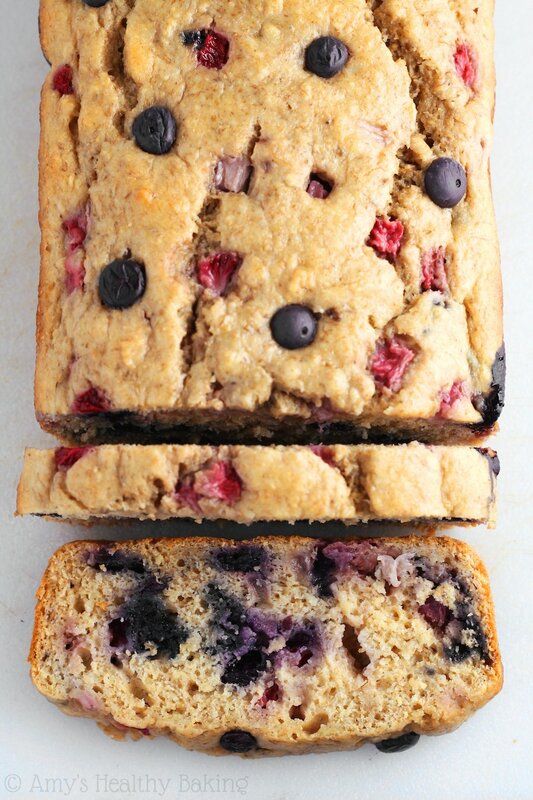 The rest of the tender texture comes from my favorite ingredient in healthier baking: Greek yogurt. 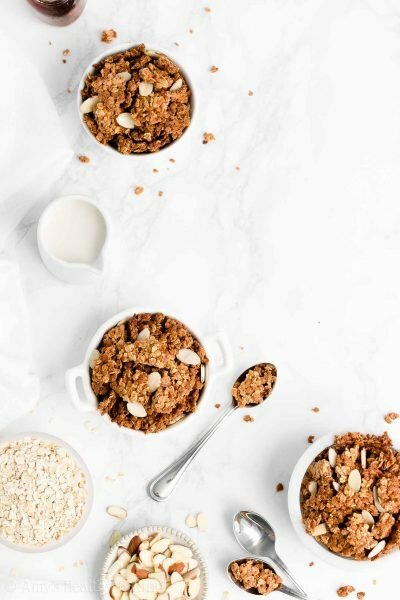 If you’ve read my blog before, you’ll know just how much I adore Greek yogurt! 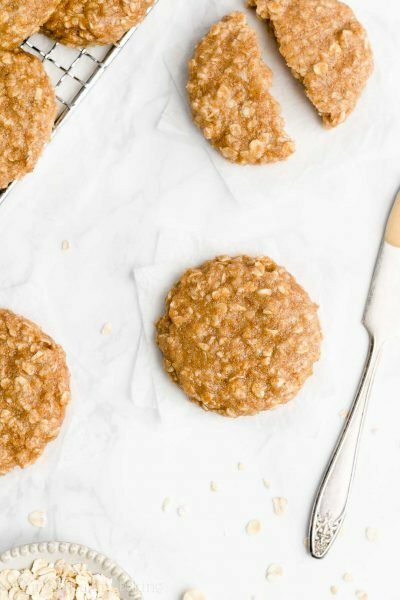 It adds the same moisture as extra oil or butter but for a fraction of the calories, and it gives your baked goods a little protein boost too. When it comes to zucchini bread, I have a secret trick to baking the perfect loaf: pat the zucchini dry with paper towels! Zucchini contains a lot of moisture, which it releases during baking. 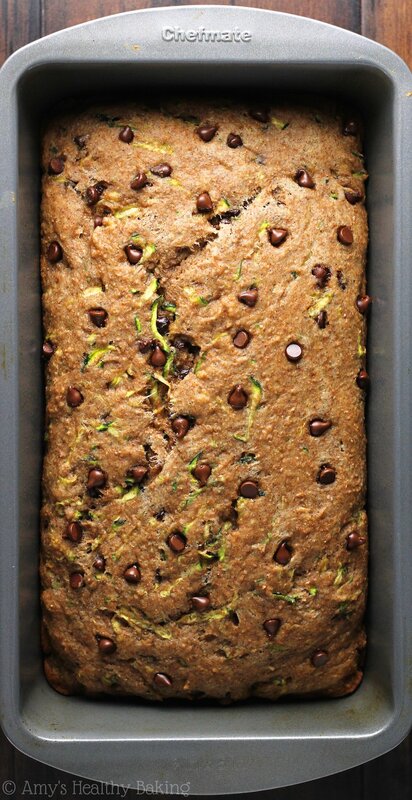 If you add too much zucchini, that extra moisture will destroy the structure of your quick bread and make it sink in the middle while cooling. To add as much zucchini as possible without the collapsing problem, pat the zucchini dry to remove the excess moisture! 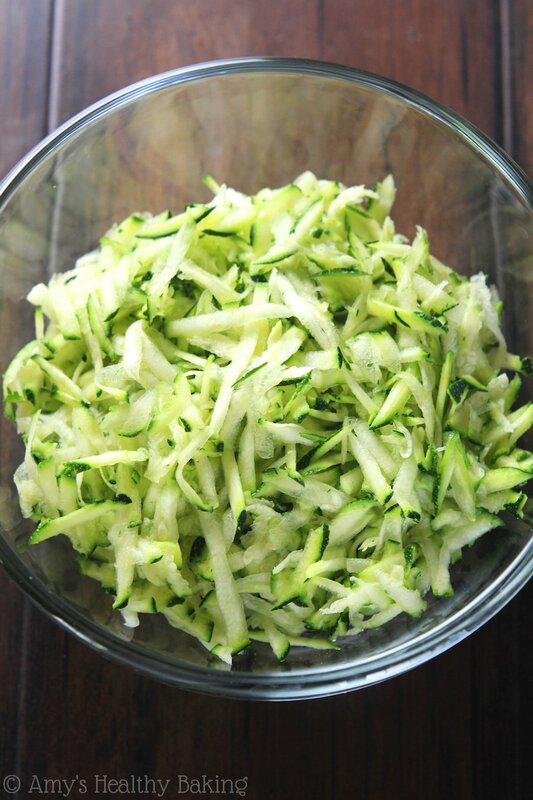 Lay a double-thick layer of paper towels on your cutting board, and arrange the freshly shredded zucchini on top. Place another double-thick layer of paper towels on the zucchini, and gently press down until the top towel turns wet. Then voila! You’re ready to add the zucchini to the batter. And of course, who could forget those chocolate chips that you convinced me to add? 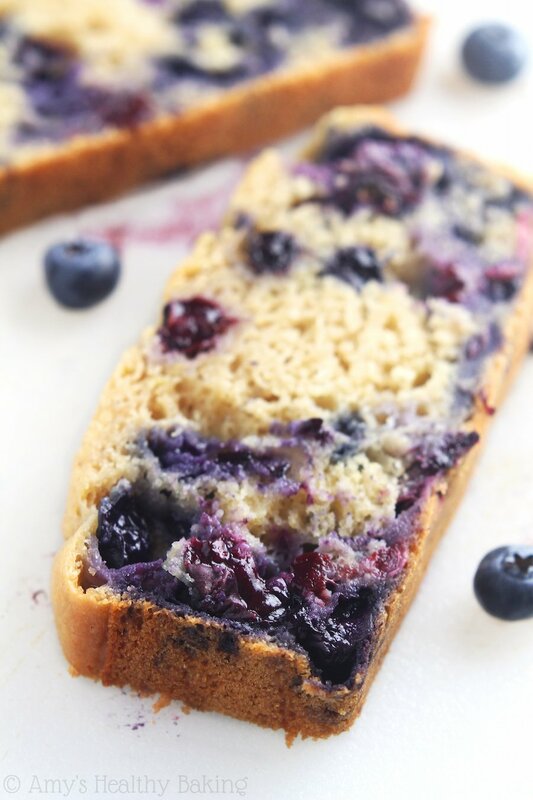 Their warm, melty, gooey pockets of decadence hiding among the crevices… Pure bliss. 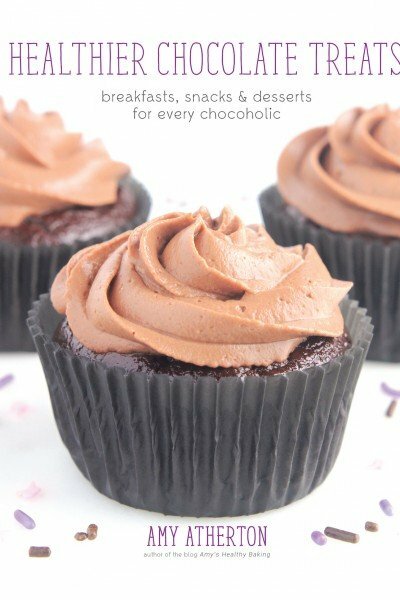 I prefer mini chips so that nearly every bite contains a little morsel of chocolate, and I always sprinkle some on top for a sweet finishing touch. I think I should’ve bought more zucchini at the store… Or maybe plant some in the garden next year! 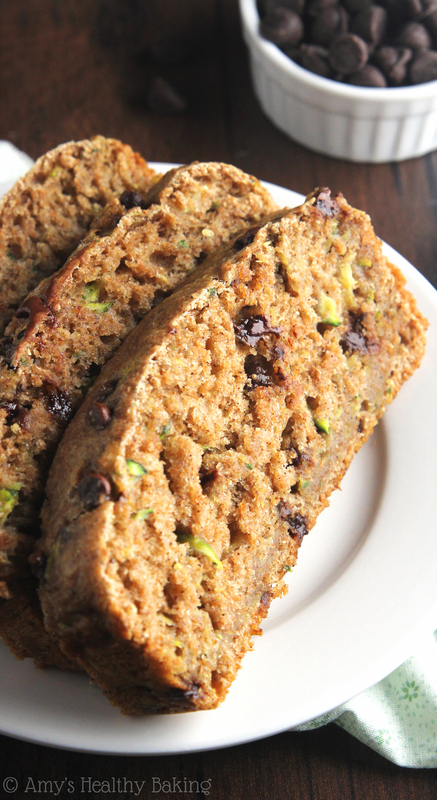 This zucchini bread is extremely tender and full of cozy spices. The chocolate chips take it over the top! Store any leftovers in an airtight container or tightly wrapped in plastic wrap in the refrigerator for up to 6 days. Preheat the oven to 350°F, and line the inside of a 9x5” loaf pan with foil or parchment paper. Lightly coat with nonstick cooking spray. In a medium bowl, whisk together the flour, cinnamon, nutmeg, baking powder, baking soda, and salt. In a separate bowl, whisk together the coconut oil, egg, and vanilla. Stir in the Greek yogurt, mixing until no large lumps remain. Stir in the maple syrup. Alternate between adding the flour mixture and milk to the egg mixture, beginning and ending with the flour, and stirring just until incorporated. (For best results, add the flour in 3 equal parts.) Set aside 1 teaspoon of chocolate chips. 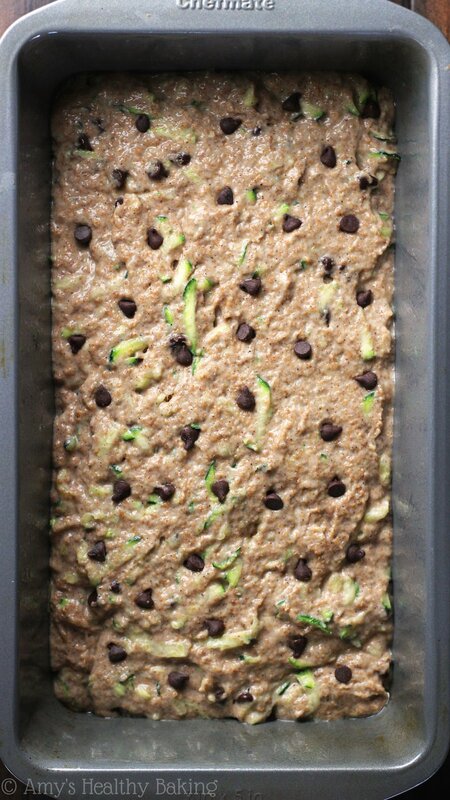 Gently fold in the remaining chocolate chips and zucchini. Spread the batter into the prepared pan, and gently press the reserved chocolate chips into the top. Bake at 350°F for 50-60 minutes, or until a toothpick inserted into the center comes out clean. Cool in the pan for 10 minutes before transferring to a wire rack. Notes: The zucchini must be patted dry to remove excess moisture. This prevents the loaf from collapsing while it cools. To do so, lay a double-thick layer of paper towels onto a cutting board, and arrange the freshly shredded zucchini on top. Place another double-thick layer of paper towels on the zucchini, and gently press down until the top towel turns wet. 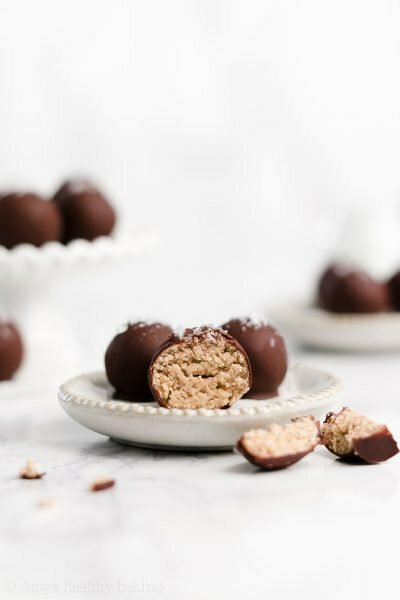 For a gluten-free version, use the following blend: 1 cup (120g) millet flour, ½ cup (60g) brown rice flour, ½ cup (60g) tapioca flour, and 1½ teaspoons xanthan gum. Store-bought gluten-free flour blends should also work, as long as they're measured like this. Honey or agave may be substituted for the maple syrup. Alternatively, ½ cup (106g) of light brown sugar plus an additional ¼ cup (60mL) of milk may be substituted instead.